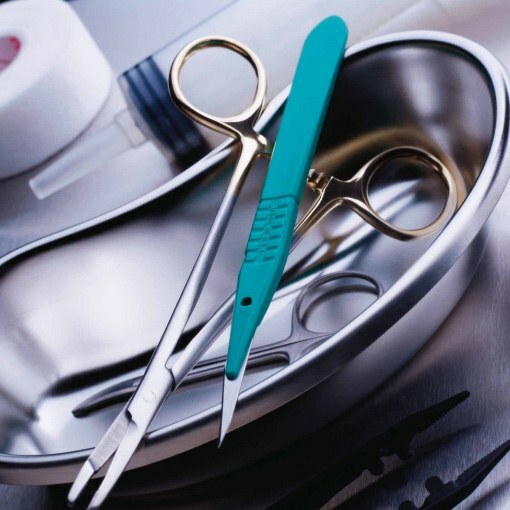 Processing of postoperative seams is daily disinfecting and dressing changes. As an antiseptic, you can use hydrogen peroxide, brilliant green, chlorhexidine and other medicines. Uninfected operating seams should be treated with antiseptic solutions - chlorhexidine, fukortsin, Zelenka, hydrogen peroxide. Seams treat with antiseptics recommended during the first 14 days after surgery. Sometimes this period is less, sometimes more. For example, after caesarean stitches and bandage removed within a week. For the disinfection of the surgical site, apply on a cotton swab a small amount of green stuff or other antiseptic and gently treat the sutured wound. Wipe the seam is not recommended - it slows down the process of tissue regeneration. Surgeons suggest to handle the seam with antiseptic twice a day. If the seam is large, it is better not to treat it with a cotton swab, a cotton pad or a piece of sterile cloth soaked in an antiseptic solution. After disinfection put on the seam a clean, dry bandage or silicone adhesive. If the seam is dry, it does not stick, so he healed even faster. If in some places the seam is inflamed - you can handle their alcohol. In case inflammation cannot cope on their own - consult your doctor. If the seam formed scar, treat it with a gel "Contractubex". It is composed of onion extract, allantoin and heparin sodium. "Contractubex" helps fight inflammation, prevents scarring and blood clots, and improves the hydrating tissues and promotes rapid healing of wounds. Dispense a small amount "Contractubex" on the scar and gently RUB in the gel until it is completely absorbed. In traditional medicine to prevent scarring and accelerate healing of stitches apply the cream "Calendula" with the addition of orange and rosemary oil. Also a good helping of tea tree oil and lavender oil.